Kristen Demeter identified lighting, ventilation and retrocommissioning projects at REI. Kristen Demeter was hosted as an EDF Climate Corps fellow at REI, to identify lighting retrofit, ventilation and retrocommissioning projects for distribution centers and office buildings. Retrocommissioning ensures that building systems - such as lighting and HVAC - are installed, operated, and maintained according to the owner's needs. At REI, retrocommissioning could save 10-16 percent of the energy used in each of its distribution centers, and, thanks to utility rebates, do so at a very low cost. To reduce natural gas use in REI's Pennsylvania distribution center, Demeter recommended installing destratification fans, which lower heating costs by pushing rising, heated air from the ceiling back to the floor. Demeter also recommended an office lighting retrofit with advanced controls, such as motion sensors and a lighting management system, which could decrease lighting energy use by 70 percent. Together these projects could save REI save nearly $110,000 over their lifetimes, as well as 665,000 kilowatt hours, nearly 25,000 therms of natural gas and nearly 500 metric tons of carbon dioxide every year. 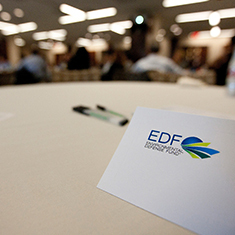 Kristen Demeter, a student at Yale University, was hired as the 2012 EDF Climate Corps fellow at REI.